The pupose of the Investor Confidence Project is to unlock access to financing for the building renovation market by standardizing how energy efficiency projects are developed, documented and measured. By providing recognised protocols, ICP propose to provide an international certifictation called Investor Ready Energy Efficiency (IREE) which insures taht best practices, the correct professionals nad thrid party validation are used to deliver high-quality projects that investors can have confidence in. ICP have instituted a Project Develper Cedential Process to train and validate the experience of firms who they consider to meet the criteria of professionalism requried to develop projects in accordance with the protocols. Only firms who are authorised may develop certified ICP Investor Ready Energy Efficiency projects for their clients and investors. 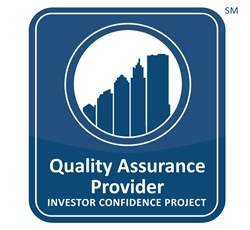 Credentialed ICP providers can be trusted by owners, investors, and others interested parties to possess the necessary credentials and experience to develop quality energy efficiency projects that conform to the Investor Confidence Project Protocols. We have an in-house Credentialed Project Developer. Prior to confirming a project is suitable as Investor Ready Energy Efficiency (IREE), third party auditing must be carried out. ICP have developed a list of approved Quality Assurance Providers to independently carry out these audits. ICP Credentialed QA Providers have been vetted for required experience, trained in the ICP System, and are authorised to provide an independent third party review of projects seeking the Investor Ready Energy Efficiency certification. We have an in-house Credentialed Quality Assurance Provider.